Nantou County Magistrate Lin Ming-chen, an outdoors enthusiast, first attempted to swim across Sun Moon Lake in 2017, finishing in three hours and six minutes to become Taiwan’s first county chief to complete the 3,000-meter swim. 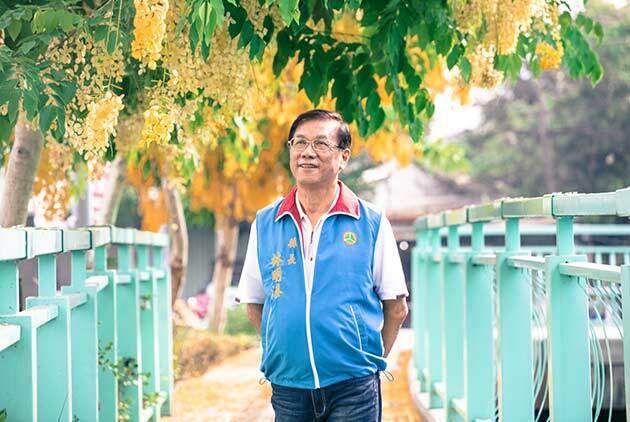 As enthusiastically as he embraces nature, he is similarly dedicated to raising Nantou’s visibility. Here, he generously shares his some of his favorite hideaways with travelers looking for an immersive experience of Nantou. Addressing the development of his home county, Lin relates that Nantou fell a few steps behind in development due to its relative seclusion. However, because of that isolation, it was able to preserve its unique natural environment and leverage it into a formidable asset in developing special attraction tourism. This special atmosphere continues to exist today. 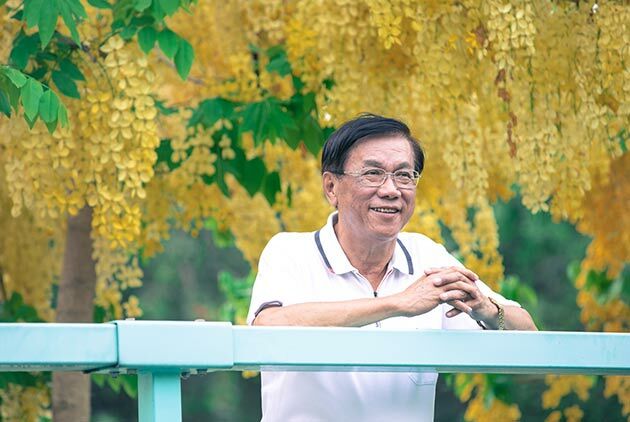 In the effort to showcase the best that nature has to offer, as a local, Lin generously shared some of his “secret hideaways” off the beaten path. First on Lin’s list is the Cingjing area on Huhuan Mountain between 1,700 and 3,000 meters above sea level. Due to the high elevation, the average temperature even during the summer months is only a little over 20 degrees Celsius, making it pleasantly cool and dry, and an ideal place to escape the heat and drink in the energizing aroma of the mountainside greenery. Further enumerating Nantou’s spectacular undiscovered hideaways, Lin breaks out in a big smile as he shares the otherworldly beauty of Caopingtou, a tea plantation in Xinyi Village. “Each year around Chinese New Year, not only is the Caopingtou tea plantation blanketed in lush green, it is bordered with an exquisite riot of color, especially the plump golden blossoms of rapeseed flowers plus the pastel pinks and reds of cherry blossoms. This visual feast is certainly a thing of rare beauty anywhere in the world,” he says. Lin notes in particular that Nantou has the largest land area devoted to growing tea in all of Taiwan. And among Nantou’s eight major tea-growing regions, Caopingtou, situated at over 1,000 meters elevation, is famous for producing Yushan tea with incomparably delicate flavor and smooth mouth feel, making it an ideal place to experience the richness and beauty of a tea-growing village. “The local farmers are exceptionally warm and welcoming, and are always ready to treat guests with delectable country dishes like free-range chicken and mountain-grown vegetables.” Tourists can even try picking and curing tea for themselves to experience the joys and wonders of the tea production process from the inside. 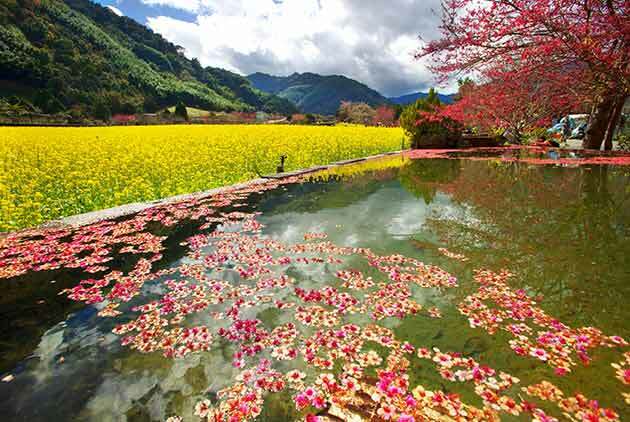 With a temperate climate making it a great place to visit year-round, Nantou is home to another of Lin’s favorite places, the hot springs village of Dongpu. Here, a soak is rewarded even during the hot summer months, when the average temperature drops to just around 20 degrees Celsius at night. What could compare to soaking in a hot spring, caressed by the cool evening breeze, while gazing up at the star-filled heavens? Lin visits as regularly as his schedule allows, coming at least once every two or three months to unwind and let the slightly alkaline carbonated spring wash away the fatigue, and the negative ion exchange rejuvenate his mind and body, sending him back to work inspired and refreshed. A foodie, Lin reminds visitors to be sure to sample the fresh food. “Aiyu jelly of exceptional quality is grown right next door to the Dongpu hot springs area. It’s known for its smooth, full texture and refreshing flavor, which goes perfectly with sour plum drink made in-house.” Summer is also grape harvest season in Xinyi Township, where the high elevation environment produces grapes with exceptional suppleness and perfectly balanced sweetness. Whether you cool off from a soak with a grape smoothie or imbibe in locally-made wine, plum wine, or limited-edition Xinyi Township specialty rice wine, you’ll find the magic of Nantou simply enchanting!